Workers in the Deaf and Hard of Hearing Community are on strike across Ontario. Show your support! We are 78% of the way to reaching our goal. Tell the CEO of the Canadian Hearing Society Julia Dumanian that workers who support the Culturally Deaf, Oral Deaf, Deafened and Hard of Hearing deserve a fair contract. 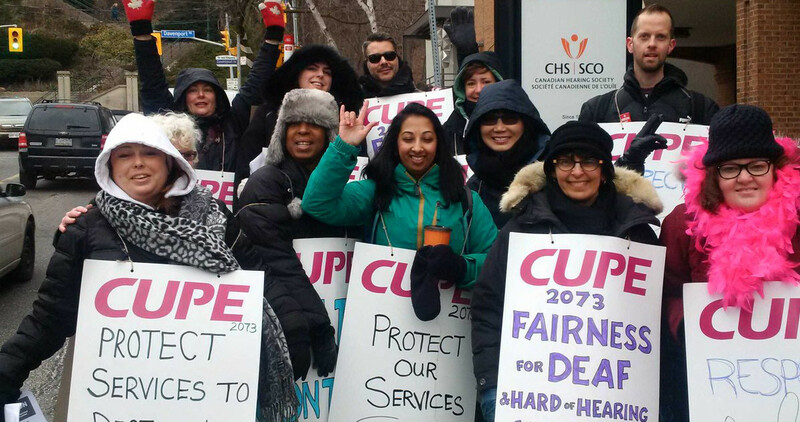 Workers at Canadian Hearing Society offices across Ontario are on strike after going four years without a contract. Instead of trying to settle a deal to put the past four years behind and focus on moving forward, the Canadian Hearing Society is asking for a large rollback to employee health benefits, with no wage increases to address the rising cost of living. Workers at the Canadian Hearing Society provide valuable services to the Culturally Deaf, Oral Deaf, Deafened and Hard of Hearing. They do interpretation work, provide employment services and mental health counselling to the community. They also operate trusted audiology and technical devices programs throughout the province. Many of these workers are part of the Deaf Community themselves. These workers deserve respect, fairness and a contract that acknowledges their work and addresses the rising cost of living of the past four years. We are calling on the CEO of the Canadian Hearing Society Julia Dumanian to stop treating workers as the enemy and work in partnership to reach a fair deal that will allow workers to continue delivering vital services to the Deaf Community.